SUNY Oswego alumnus Al Roker, weather correspondent for NBC’s "Today" show, last did live national weather segments from SUNY Oswego in 2007. He is scheduled to appear again Oct. 16 in conjunction with the college’s 10th Lewis B. O’Donnell Media Summit. OSWEGO — Members of the Central New York community are welcome to join the Weather Channel and NBC “Today” show festivities beginning at 5:30 a.m. Oct. 16, at SUNY Oswego. 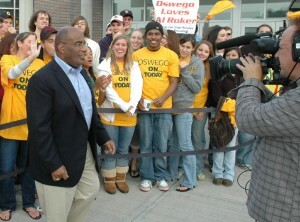 SUNY Oswego alumnus Al Roker, weather correspondent for NBC’s “Today” show, last did live national weather segments from SUNY Oswego in 2007. He is scheduled to appear again Oct. 16 in conjunction with the college’s 10th Lewis B. O’Donnell Media Summit. Al Roker, a 1976 Oswego graduate, is scheduled to broadcast his remotes for NBC’s “Today” show from the college’s Marano Campus Center as well as the entire “Wake Up with Al” show on the Weather Channel. The Crossroads Cafe in the Marano Campus Center will open at 5:30 a.m. for coffee, doughnuts and other fare. Visitors will not need a parking permit before 7:30 a.m. to park on campus. From 7:30 a.m. on, visitors may park free in the Romney lot, Lot 7, south of Route 104 at the intersection of Sheldon Avenue and Route 104 near Oswego’s western city limits. Shuttles will transport students and visitors to and from the main campus approximately every 15 minutes beginning at 7:30 a.m.